Unfortunately, too often the response to these questions is reduced to a grade or a checkmark, sometimes accompanied by a short comment. Too often, feedback operates on what has been referred to as "level of task performance" or the "self or personal level" (Hattie & Timperley, 2007) which is often unrelated to the task and offers a congratulatory statement, such as "Well done! ", or a more critical one, such as "More effort needed." The rest of my research on the blogging community documents, among other things, my attempts to develop a new persona for myself in the online community. What I eventually developed relies on very conversational engagement with students. 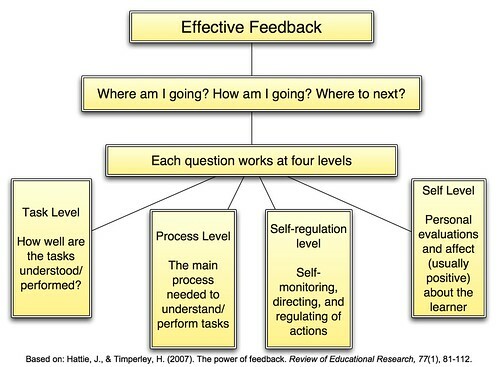 It relies on providing feedback by engaging students in conversations about their work. In other words, I learned how to effectively participate in the online interactions among my students and how to support the learning that takes place through these interactions - on individual blogs and in student discussions that develop as comments and trackbacks. My research helped me develop new ways of engaging students in conversations. That shift also shows that feedback is much more than what happens after the students submit their work.